There are times when a dream feels so real that you wake up wondering whether you were truly asleep at all. For some people, the line between wakefulness and sleep is less clear, and they actually walk or perform other activities while asleep. This is formally known as somnambulism but is more commonly referred to as sleepwalking. Sleepwalking is much more common in children than in adults but being sleep deprived can increase your risk for this behavior. Many people who sleepwalk don’t remember the incident afterward, and people who witness the event often say that the sleepwalker is difficult to awaken. Though there is a common misconception that a sleepwalker should not be woken, it can actually be very dangerous to let them continue the behavior. In this article, we will address other common misconceptions about sleepwalking in addition to covering the subject in depth, including the symptoms, causes, and treatment options for this disorder. Sleepwalking is a behavior in which a person appears to wake up during the night and engages in activity without any memory of having done so. Though the person may appear to be awake, they are still asleep and are unaware of their activity. When the episode first begins, the sleeper may sit up in bed and look around in a confused manner – they may also get out of bed quickly and walk or run away. In some cases, the sleeper may be frantic, trying to escape from some kind of threat they are dreaming. Though movement is the primary characteristic of sleepwalking, some people may shout or talk during the episode as well. People who sleepwalk are often observed to have their eyes open with a confused or glassy look, and they may engage in routine daily activities such as making a sandwich or sweeping the floor. In some cases, however, sleepwalking involves actions that are strange, out of place or downright crude. For example, the sleeper might be seen rearranging furniture, urinating in inappropriate places, or even leaving the house. In rare cases, a sleepwalker may operate a vehicle. Waking up a person who is sleepwalking may be difficult, and the sleeper may be confused or disoriented when they wake because they typically have no memory of the episode. In some cases, the sleeper may even attack the person waking them – this is more common in men than in women. Some people who sleepwalk wake on their own and find themselves in a strange place, or they may return to bed while they are still asleep and wake normally as if nothing happened. According to the National Sleep Foundation, sleepwalking effects between 1% and 15% of the American population, though the prevalence in children may be much higher. Sleepwalking typically occurs early in the night, usually between one and two hours after falling asleep. The average length of a sleepwalking episode is several minutes, though they can last longer. 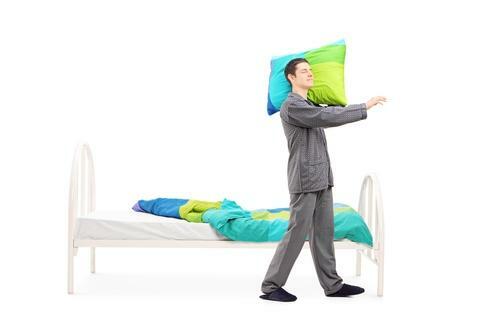 People who sleepwalk typically find that they exhibit the behavior either very rarely or very often. If a sleepwalker is woken during an episode, they may become violent during a brief period of confusion, or they may simply be confused. After waking, the sleepwalker may or may not remember the details of the episode. Some people remember bits and pieces, though it is rare to remember the entire episode with any clarity. When the sleepwalker returns to bed before waking, they may have no awareness of the episode but may experience daytime fatigue resulting from the sleep disturbance. The prevalence of sleepwalking is much higher in children than in adults, particularly among children between the ages of three and seven. It is more common in children with sleep apnea and in children who experience bedwetting. Children who sleepwalk may be seen walking toward a light or into their parents’ bedroom – they may also walk to a window or door which can put them at risk of injury. Older children tend to be more vocal and active during sleepwalking episodes and many children who sleepwalk also experience sleep terrors. There are many potential causes for sleepwalking and diagnosis is often difficult because the person may not be aware of the problem. Roughly 4% of adults are affected by sleepwalking, though the prevalence is estimated to be as high as 17% in children. There is thought to be a strong genetic link for sleepwalking – your chance of developing the behavior is two or three times higher if one or both of your parents had sleepwalking episodes as a child or in adulthood. Technically speaking, sleepwalking is a type of parasomnia – an undesirable behavior that occurs during sleep. It is also classified as a disorder of arousal which simply means that it occurs during N3 sleep, the deepest stage of non-rapid eye movement (NREM) sleep. Sleep terrors are another NREM disorder, and it often occurs together with sleepwalking. Some of the most common triggers for both sleepwalking and sleep terrors include stress, sleep deprivation, fever, and disruptions in normal sleep habits. It can also be related to excessive alcohol consumption or simply sleeping in unfamiliar surroundings. In some cases, sleepwalking is secondary to some kind of underlying condition. Sleepwalking may also be triggered by the use of medications, including medications used to treat the disorders listed above. Sedatives and sedative-hypnotics that promote relaxation or sleep may increase your risk for sleepwalking, as can the use of neuroleptics which are sometimes used to treat psychosis. Even stimulants and antihistamines have been linked to episodes of sleepwalking. A single episode of sleepwalking is generally no cause for concern, particularly when you suspect that it may be triggered by a brief period of sleep deprivation. When sleepwalking occurs with some regularity, however, it should be brought to your doctor’s attention. Because sleepwalking has been linked to a wide variety of other conditions, you’ll want to provide your doctor with as much information as you can, so he can make an accurate diagnosis. Keep reading to learn more about how sleepwalking is diagnosed. Before getting into the details of diagnosing and treating sleepwalking, we must answer the question of whether sleepwalking needs to be treated. 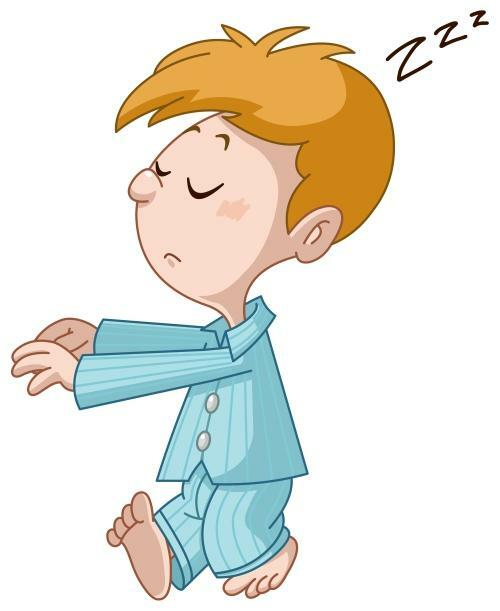 In children, sleepwalking is fairly normal and typically resolves on its own without treatment. Parents should, however, be aware of the behavior and take the necessary steps to keep their child safe. If the behavior continues into adolescence or adulthood, the risk of injury becomes much higher, and you should bring the problem to your doctor’s attention. When you share your concerns about sleepwalking with your doctor, he may refer you to a board-certified sleep medicine physician who can assess your symptoms and determine the underlying cause of your sleepwalking. You may be asked to keep a sleep diary for one to two weeks to track your symptoms, and you may be asked to rate your level of daytime sleepiness using the Epworth Sleepiness Scale. Your doctor will also perform a thorough physical exam, take a medical history, and ask about any other symptoms as well as any medications you may be taking. Using various diagnostic tools, your doctor will attempt to identify the underlying cause of your sleepwalking such as another sleep disorder, a medical condition, a medication, a mental health disorder, or a substance abuse problem. In some cases, you may be asked to complete a nighttime sleep study called a polysomnography to confirm a diagnosis. You’ll be asked to spend the night in a sleep lab connected to sensors that will gather data about your brain waves, blood oxygen levels, heart rate, and breathing as well as your eye and muscle movements. What Are the Treatment Options for Sleepwalking? In cases of occasional sleepwalking, treatment generally isn’t necessary, and, in children, it usually goes away by the teen years. When there is a risk for personal injury or if the behavior is disruptive to the family, however, treatment may be required. If your sleepwalking is linked to an underlying condition, your doctor may recommend treatment for that condition which could resolve your symptoms. In cases where your sleepwalking is triggered by a certain medication, changing the dosage or switching to another medication might help. There are also cases in which starting pharmaceutical treatment may help – this is most commonly used in cases where the sleepwalker is at risk for injury or if the behavior disrupts the family. Medications that are sometimes used to treat severe cases of sleepwalking include estazolam, clonazepam, and trazodone. Outside of pharmaceutical treatments for sleepwalking, some patients benefit from anticipatory awakenings. For example, if you tend to sleepwalk at a predictable stage of the sleep cycle, having someone wake you about 15 minutes beforehand and staying awake for a few minutes before returning to sleep may prevent a sleepwalking episode. There is also some evidence to suggest that hypnosis or self-hypnosis to achieve a deep state of relaxation may help. You can learn these techniques from a trained professional who may also be able to help you learn ways to reduce stress and improve sleep. Take steps to make the environment safe by locking doors and windows or placing alarms on exterior doors. Children who sleepwalk should not sleep in bunk beds. Avoid waking a sleepwalker unless they are at risk for injury – simply lead them gently back to bed and make sure they fall back into a restful sleep. Make an effort to stick to a regular sleep schedule – sleep deprivation and daytime fatigue can trigger episodes of sleepwalking. Engage in quiet and relaxing activities before bed to promote a deeper state of relaxation – try reading a book, taking a bath, or meditating. Take steps to reduce your stress levels – if you also suffer from anxiety, finding a way to naturally resolve some of your anxiety may help. Avoid drinking alcohol, particularly to excess, as alcohol consumption can disrupt the quality of your sleep and can trigger sleepwalking episodes. Sleepwalking is not necessarily a cause for concern unless it comes on suddenly in adulthood or happens with some regularity. If you are concerned about your own sleepwalking or someone in your household, take the time to gather information about the episodes so you can present your doctor with a complete picture to help him make a more accurate diagnosis and recommend a course of treatment.